Showing items in category New South Wales, sorted by newest listed first. 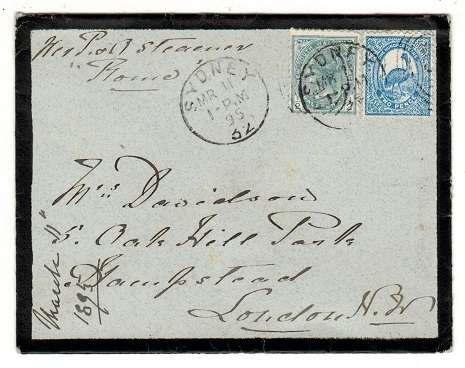 AUSTRALIA (New South Wales) - 1854 5d rate 'laureated' cover to UK. 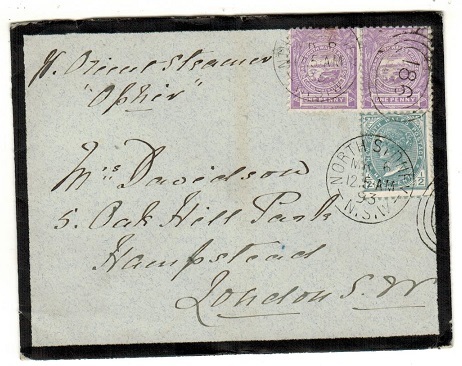 1854 (JY.27) cover to Scotland (a little grubby appearance) rated '8' on front in manuscript & bearing 'Laureated' 1d & 2d pair of the imperforate issue (SG type 8) tied by barred oval cancels (RL type C1) with two strikes of the SYDNEY/NEW SOUTH WALES crown h/s (RL type 8) on reverse. AUSTRALIA (New South Wales) - 1894 2d blue PSE used locally at ST.MARY's with UNCLAIMED h/s. 1894 (SP.27.) use of 2d blue on cream postal stationery envelope addressed locally with '865' duplex and ST.MARY'S arrival cds but undelivered and with black boxed UNCLAIMED handstamp applied. DEAD LETTER OFFICE/SYDNEY b/s. 1883 (FE.22.) 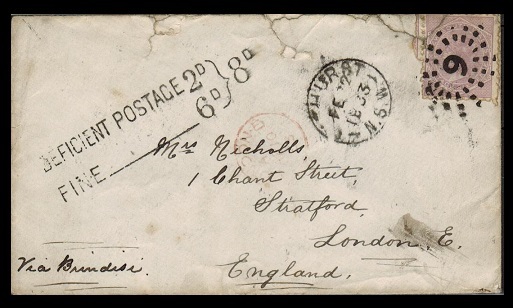 cover addressed to UK bearing 6d adhesive tied by sunburst type '9' handstamp with BATHURST/NSW 'proving' cds at left and struck by scarce DEFICIENT POSTAGE 2d/FINE 6d /8d mark. 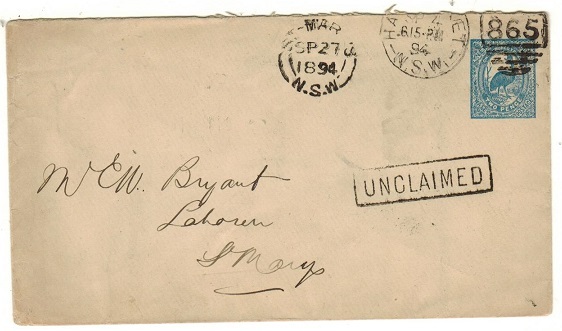 AUSTRALIA (New South Wales) - 1892 cover to Sydney with postal stationery 'cut out' usage. 1892 cover addressed to Sydney bearing1/2d grey postal stationery wrapper 'cut outs' tied alongside the 'halfpenny' black on 1d grey 'cut out' by oval ringed NSW cancels with SYDNEY cds cds applied over. 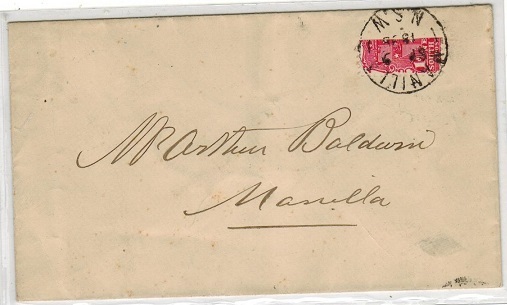 AUSTRALIA (New South Wales) - 1898 1d scarlet BI-SECTED cover used at MANILLA/NSW. 1898 (SP.9.) 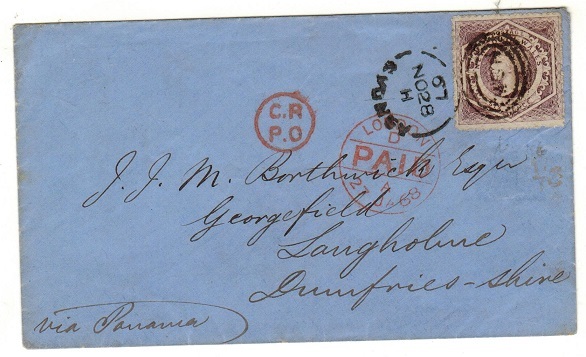 cover addressed locally bearing 1d scarlet (SG type 62) VERTICALLY BI-SECTED to pay the local 1/2d rate and tied by MANILLA/NSW cds. A rare bisect use. AUSTRALIA (New South Wales) - 1895 2 1/2d rate cover to UK used at SYDNEY. 1895 (MR.11.) 'mourning' cover addressed to UK bearing 1/2d and 2d adhesives tied by by SYDNEY/32 cds. AUSTRALIA (New South Wales) - 1893 2 1/2d rate cover to UK used at NORTH SYDNEY. 1893 (MR.6.) 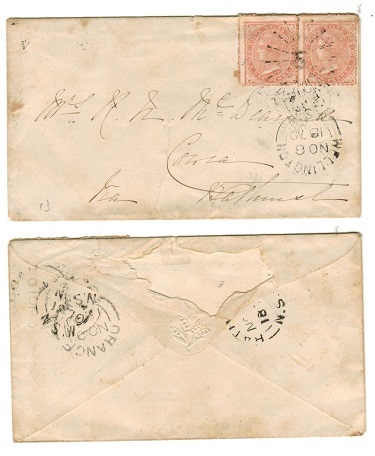 'mourning' cover addressed to UK marked 'Per Orient Steamer/Ophir' bearing 1/2d and 1d pair tied by neat '186' oval h/s with NORTH SYDNEY/NSW 'proving' cancel alongside. AUSTRALIA (New South Wales) - 1909 'DEF 5/FINE 5/10 CENTIMES' underpaid cover to USA. 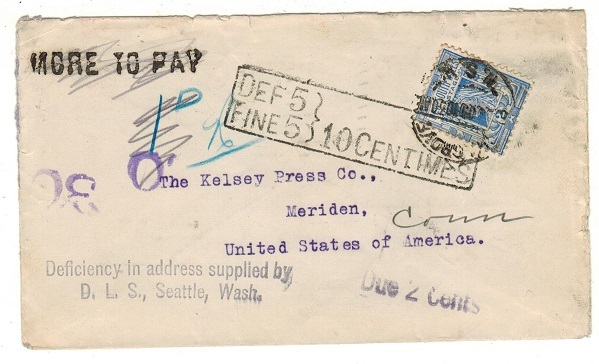 1909 cover addressed to USA bearing 2d blue adhesive tied by HILL GROVE cds but being underpaid having scarce MORE TO PAY h/s applied and black boxed DEF 5/FINE 5/10 CENTIMES instructional mark. DUE 2 CENTS applied on arrival in USA. AUSTRALIA (New South Wales) - 1908 2d rate postcard use to Germany used at JENOLAN. 1908 (FE.21.) 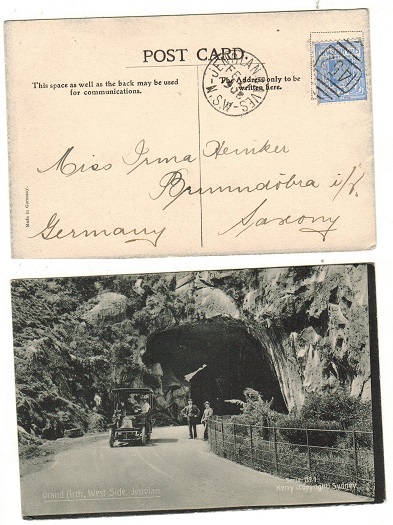 use of picture postcard addressed to Germany depicting 'Grand Arch, West Side, Jenolan bearing NSW 2d adhesive tied by '1452' barred duplex with JENOLAN CAVES/NSW cds alongside. A fine 'proving' card. 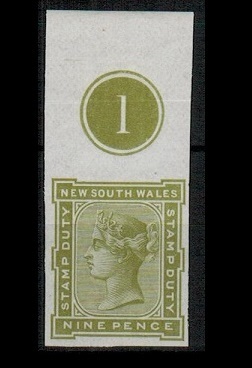 AUSTRALIA (New South Wales) - 1904 'DEFt 2d/FINE 2d/4d' deficient postage cover to Tasmania. 1904 (SP.20.) cover addressed to Tasmania with HOBART arrival b/s dated 24.SE.04 and being underpaid having a black boxed DEFt. 2d/FINE 2d/4d tax mark applied. AUSTRALIA (New South Wales) - 1885 (circa) piece of 'NSW' watermarked paper. SG type 41. 1885 piece of printers watermarked paper (60x150mm) used for the issues of New South Wales. 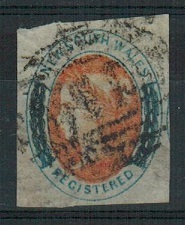 The paper is gummed and shows 6 examples of the 'NSW' watermark (SG type 41) with a near complete NEW SOUTH WALES watermark in right margin. 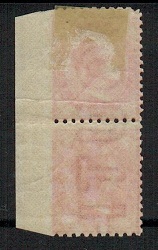 A scarce piece of official stamp paper. AUSTRALIA (New South Wales) - 1867 6d rate cover to UK used at SYDNEY. 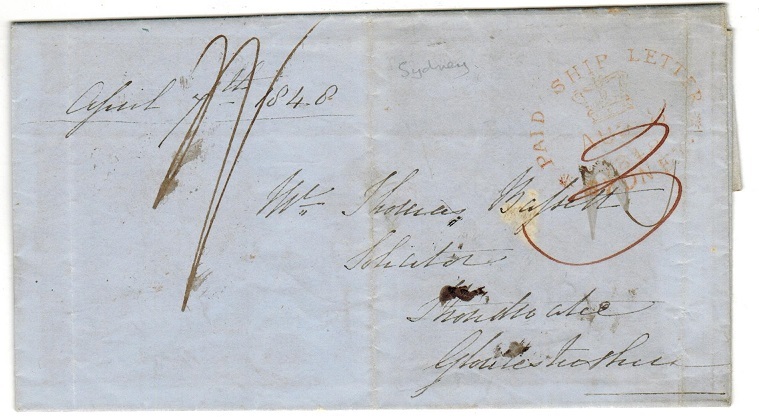 NEW SOUTH WALES - 1867 (NO.28) cover to UK bearing 6d (SG type 17) tied by oval ringed 'N.S.W' cancel with fine SYDNEY cds alongside (code H). Ringed C.R./P/O. h/s & red LONDON/D/PAID/A arrival cds dated 27.JA.68. 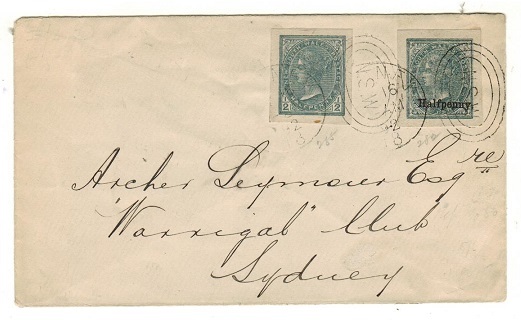 AUSTRALIA (New South Wales) - 1888 2d blue PSE local use used at TRAVELLING POST OFFICE. H&G 5. 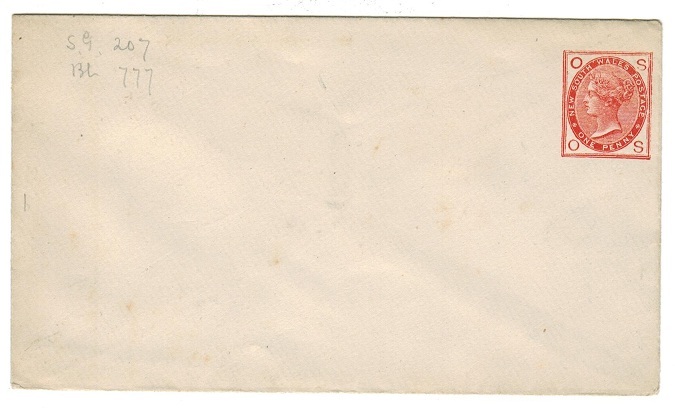 1888 2d blue on white laid paper postal stationery envelope (size a) addressed locally (ironed out crease and some tone spots) cancelled by TRAVELLING POST OFFICE/NSW cds dated OC.8.96. H&G 5. 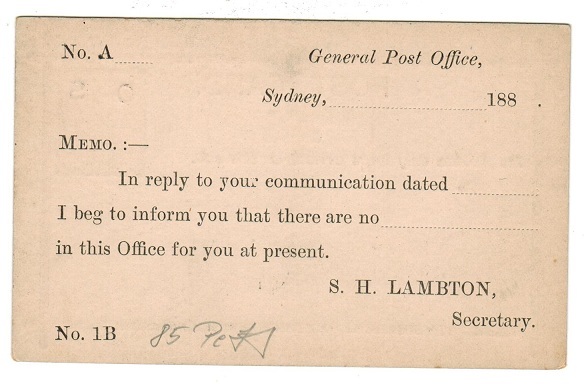 AUSTRALIA (New South Wales) - 1890 (circa) TELEGRAM envelope unused. 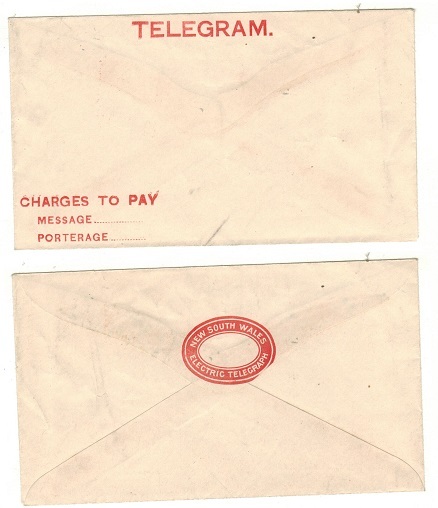 1890 (circa) red on white (136x78mm) TELEGRAM envelope pre-printed at bottom left CHARGES TO PAY/MESSAGE…./PORTERAGE without NEW SOUTH WALES/ELECTRIC TELEGRAPH oval on reverse flap. AUSTRALIA (New South Wales) - 1897 1d vermilion illustrated PSC unused. H&G 19a. 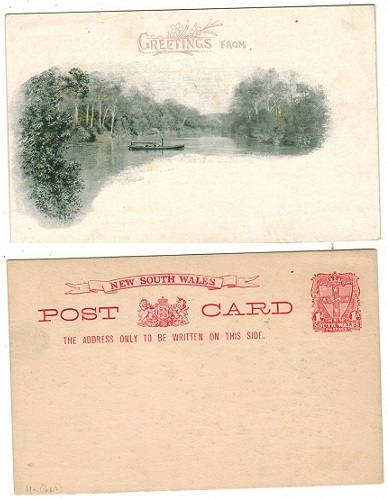 1897 1d vermilion on cream 'Greetings From' illustrated postal stationery postcard in fine unused condition depicting 'paddle steamer on river'. H&G 19a. AUSTRALIA (New South Wales) - 1897 'Diamond Jubilee and Hospital Charity' pair mint. SG 280-281. 1897 1d (1/-) and 2 1/2d (2/6d) 'DIAMOND JUBILEE AND HOSPITAL CHARITY' adhesives in fine mint condition. The 2/6d has salvage hinge. Such attractive stamps. SG 280+281. AUSTRALIA (New South Wales) - 1871 1/- green IMPERFORATE PLATE PROOF pair. 1871 1/- (SG type 38) IMPERFORATED PLATE PROOF top marginal pair printed in the un-issued colour of green on unwatermarked gummed paper. AUSTRALIA (New South Wales) - 1888 1d brick red PSE unused with STAMP INVERTED H&G 7. 1888 1d brick red 'O.S.' 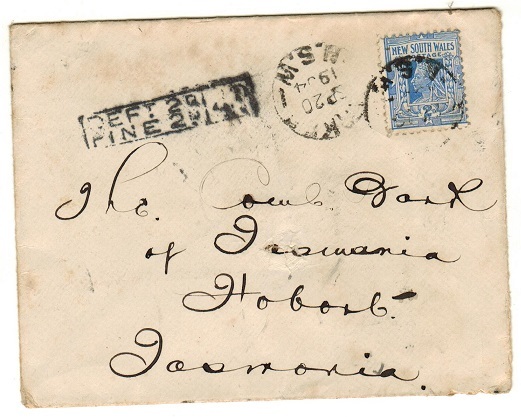 postal stationery envelope in unused condition (somewhat dirty and aged along its flap) but showing the major variety STAMP PRINTED UPSIDEDOWN AT LOWER LEFT CORNER. H&G 7. 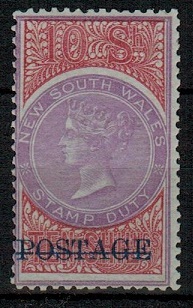 1885-86 10/- mauve and claret perf 12 in very fine fresh mint condition showing sideway 'NSW' watermark and overprinted POSTAGE in blue. A lovely example. SG 241b. AUSTRALIA (New South Wales) - 1881 9d green 'Stamp Duty' IMPERFORATE PLATE PROOF. 1881-92 9d green STAMP DUTY issue in a very fine fresh PLATE 1 top marginal IMPERFORATE PLATE PROOF example on gummed paper. Barefoot type 51. Very scarce. AUSTRALIA (New South Wales) - 1868 4d 'Stamp Duty' IMPERFORATE PLATE PROOF block of four. 1868 4d orange and lilac IMPERFORATE PLATE PROOF in a fine mint bottom marginal block of four of four of the STAMP DUTY adhesive (SG type 43) printed on gummed paper and showing sideways 'NSW' watermark. AUSTRALIA (New South Wales) - 1851 local entire from SYDNEY to CARCOAR bearing 2d imperforate. 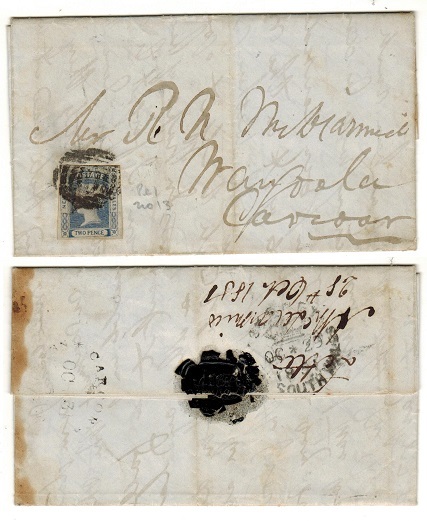 1851 entire addressed locally to Carcoar bearing 2d ultramarine imperforate (SG type 8) noted as plate 1 number 13 tied by duplex cancel with SYDNEY/NEW SOUTH WALES crowned b/s dated OC.29.1851 & scarce oval CARCOAR/NEW SOUTH WALES arrival strike. 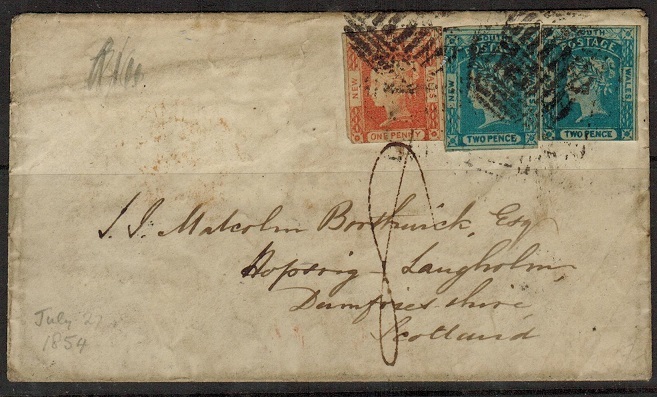 AUSTRALIA (New South Wales) - 1870 2d rate local '5 - proving' cover used at WELLINGTON. 1870 (NO.8.) cover addressed locally (part of reverse flap missing) bearing 1d adhesive pair tied by lovely star '5' cancel with WELLINGTON/N.S.W. cds below. Numeral 5 being allocated to Gosford. Various transit b/s's including ORANGE dated NO.9.1870. Despite the flap damage a attractive pretty cover. AUSTRALIA (New South Wales) - 1892 3d rose RPSE uprated locally and used at SYDNEY. H&G 7a. 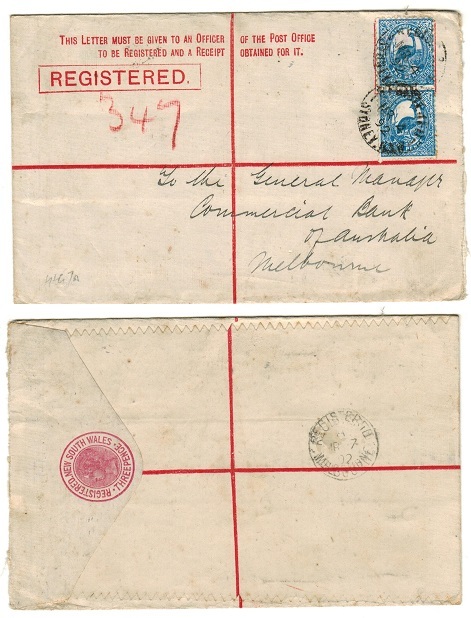 1892 3d rose on white registered postal stationery envelope (size G) addressed to Melbourne and bearing additional 2d blue pair tied by REGISTERED/SYDNEY.NSW cds dated MR.4.92. H&G 7a. AUSTRALIA (New South Wales) - 1898 3d rose RPSE uprated to Austria and used at MEREWETHER. H&G 11a. 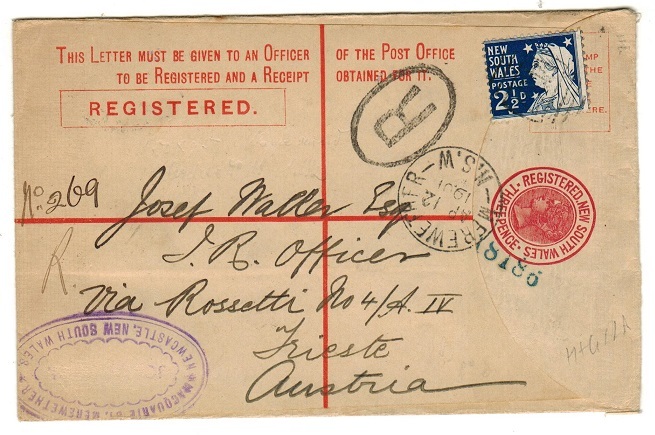 1898 3d rose on cream registered postal stationery envelope (size G) with flap at right addressed to Austria and bearing additional 2 1/2d adhesive tied MEREWETHER/N.S.W. dated AP.12.1901. H&G 11a. AUSTRALIA (New South Wales) - 1908 1d red 'Amercian Fleet' illustrated PSC unused. H&G 34. 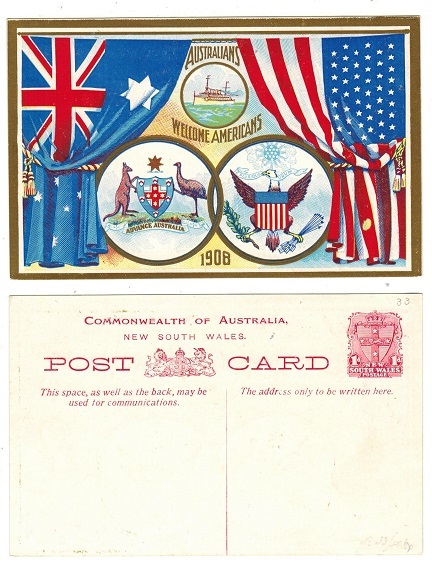 1908 1d red on white coloured 'Australians Welcome Americans/1908' fleet postal stationery postcard in fine unused condition. H&G 34. 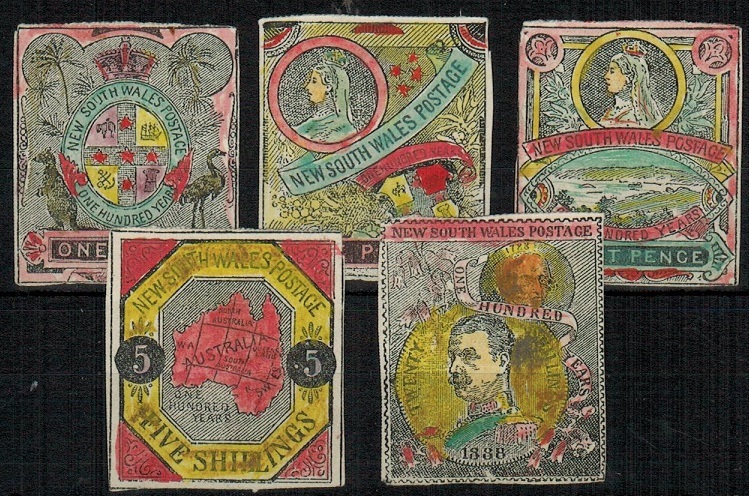 AUSTRALIA (New South Wales) - 1890 (circa) range of five un-adopted hand washed fantasy issues. 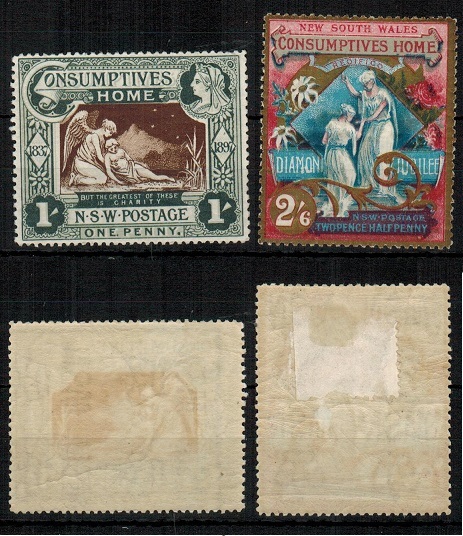 1890 (circa) range of five 'fantasy' adhesives in 1d, 6d, 8d, 5/- and 20/- values of un-adopted designs printed in black and hand washed in colour and printed on the reverse of text from a contempory hand-book. An unusual and attractive lot. AUSTRALIA (New South Wales) - 1897 1d red postal stationery letter card unused SPECIMEN. H&G 5. 1897 red on grey postal stationery lettercard in unused condition with some text blanked out on reverse side and with 'Fiji' added handstamped SPECIMEN in black. H&G 5. AUSTRALIA (New South Wales) - 1893 1 1/2d+ 1 1/2d PSRC unused SPECIMEN. H&G 15. 1893 1 1/2d + 1 1/2d blue on cream postal stationery reply type postcard in unused condition handstamped SPECIMEN in black. H&G 15. AUSTRALIA (New South Wales) - 1848 PAID SHIP LETTER/SYDNEY entire to UK. 1848 (AUG.8.) stampless entire addressed to UK with manuscript rate mark on front and struck by red crowned PAID SHIP LETTER/SYDNEY h/s. (Robson Lowe type 21). LONDON receiving and STROUD arrival b/s. AUSTRALIA (New South Wales) - 1906 5d rate registered cover to UK used at SYDNEY. 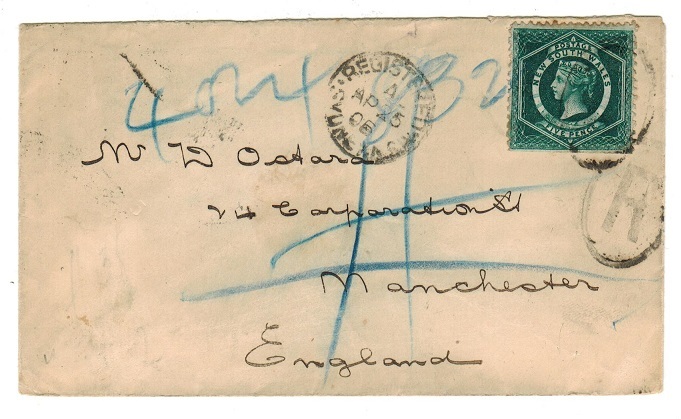 1906 (AP.25) reg'd cover to UK bearing 5d bluish green adhesive (SG type 15) tied by oval strike with REGISTERED/SYDNEY cds at left. 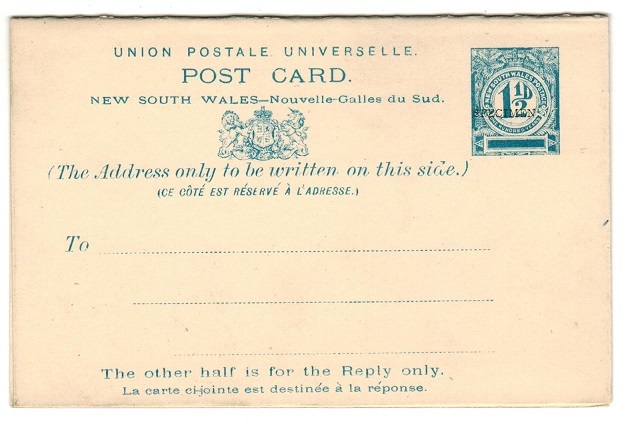 AUSTRALIA (New South Wales) - 1902 underpaid 'NSW/T' tax marked postcard to UK. 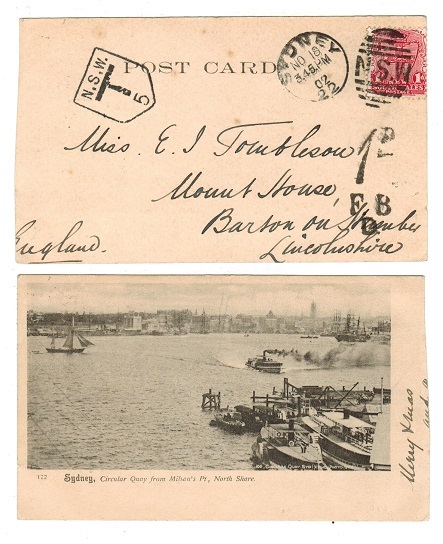 1902 (NO.18) use of picture postcard to UK depicting 'Sydney-Circular Quay from Milson's Point, North Shore' bearing 1d 'NSW' adhesive tied SYDNEY 'NSW' duplex with scarcer shield type N.S.W./T/5 tax h/s applied at left. 1d/F.B./D mark applied on arrival. AUSTRALIA (New South Wales) - 1856 (6d) salmon and indigo used. SG 103. 1856 (6d) salmon and indigo (SG type 15) IMPERFORATE adhesive for use on registered letters. Cancelled by duplex strike. SG 103. AUSTRALIA (New South Wales) - 1898 3d RPSE uprated with additional 1d (5) to India. H&G 11a. 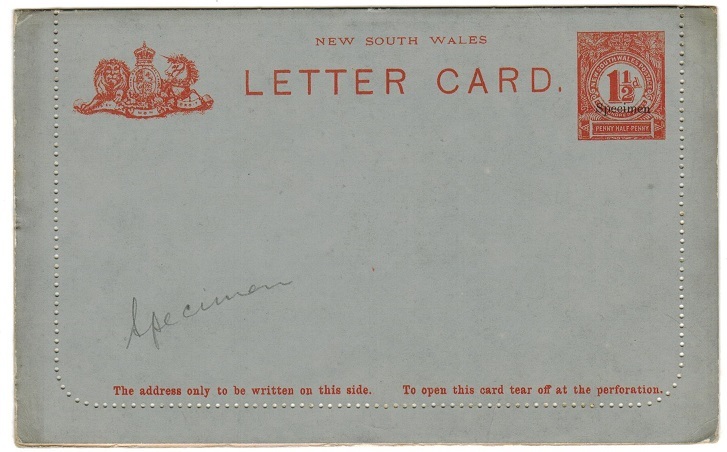 1898 3d rose on cream registered stationery envelope (size G) with flap at right addressed to India and bearing additional 1d adhesive (x5) tied by numerous REGISTERED/SYDNEY NSW cds's dated OC.13.00. H&G 11a. 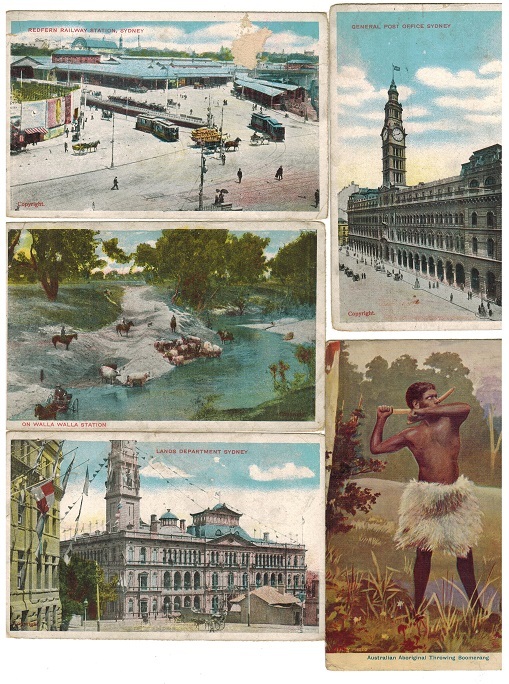 AUSTRALIA (New South Wales) - Four 1906 postcards to UK used at '779' CARRINGTON. 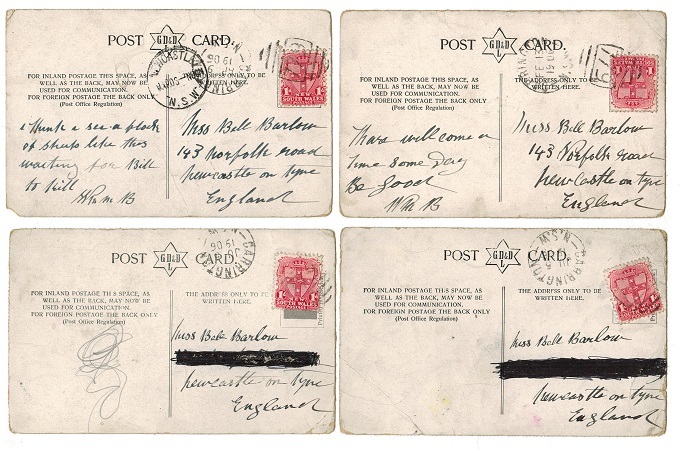 1906 correspondence of four coloured picture postcards addressed to UK each bearing 1d 'arms' adhesives tied by '779' duplex's with CARRINGTON/N.S.W. cds's alongside. (4 cards). 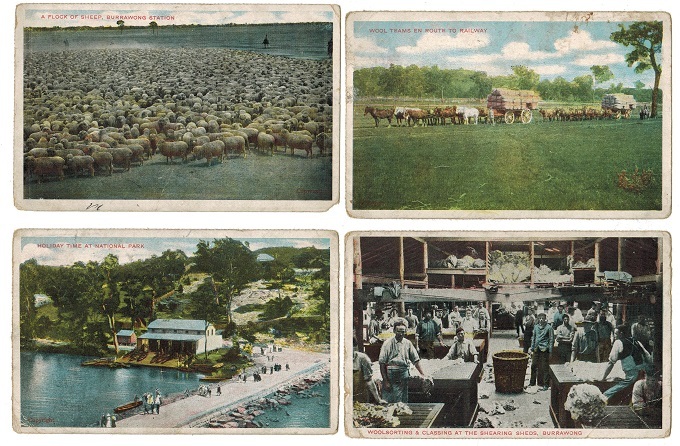 AUSTRALIA (New South Wales) - Five 1906 postcards used at '779' CARRINGTON. 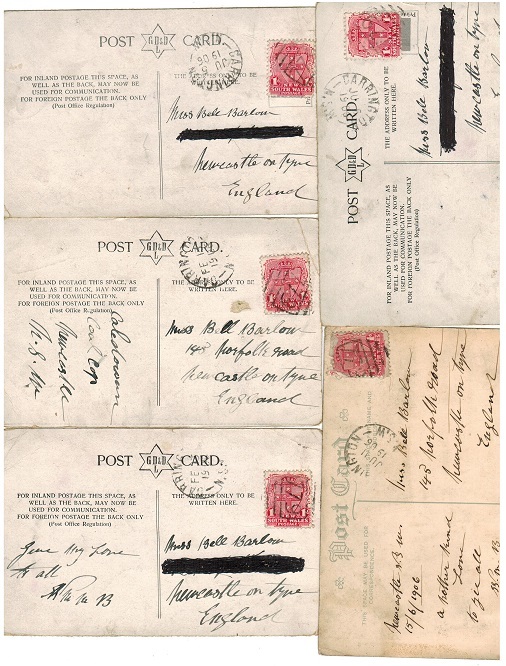 1906 correspondence of five coloured picture postcards addressed to UK each bearing 1d 'arms' adhesives tied by '779' duplex's with CARRINGTON/N.S.W. cds's alongside.m (5 cards). AUSTRALIA (New South Wales) - 1881 1d violet OFFICIAL RETURN O.H.M.S. envelope used. 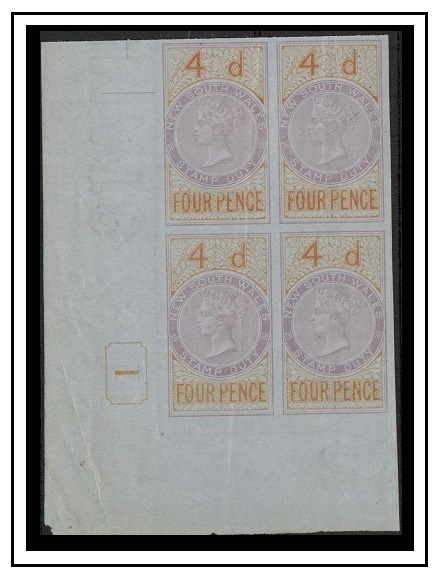 1888 1d violet on cream pre-pinted ON HER MAJESTYS SERVICE/OFFICIAL RETURNS ONLY pre-printed envelope with 'O.S.' in white circles at the top of the stamp addressed to Sydney and cancelled by oval three ringed '182' strike with NEWTOWN/NSW proving cds alongside dated FE.27.93. Used by the Publiv School Savings Bank for returns (size 225x97mm) and with red creasted curved reverse flap. Fine and scarce. AUSTRALIA (New South Wales) - 1895 1/- black TELEGRAM form unused handstamped SPECIMEN. H&G 2. 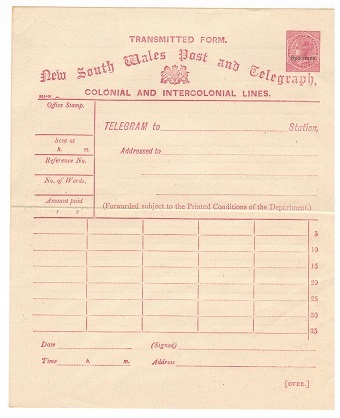 NEW SOUTH WALES - 1895 1/- black on cream NEW SOUTH WALES POST AND TELEGRAPH COLONIAL AND INTERNATIONAL LINES telegram form in fine unused condition handstamped SPECIMEN in red. Scarce thus. H&G 2. AUSTRALIA (New South Wales) - 1895 6d violet TELEGRAM FORM unused handstamped SPECIMEN. H&G 1. 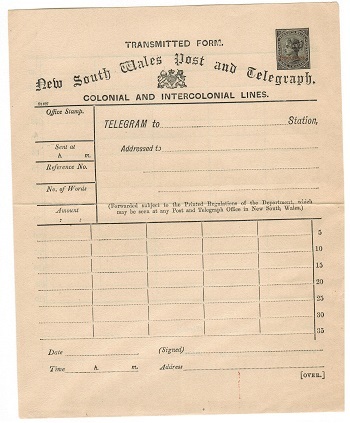 NEW SOUTH WALES - 1895 6d violet red on cream NEW SOUTH WALES POST AND TELEGRAPH COLONIAL AND INTERNATIONAL LINES telegram form in fine unused condition handstamped SPECIMEN in black. Scarce thus. H&G 1. AUSTRALIA (New South Wales) - 1887 1d rose PSC unused overprinted 'O.S.'. H&G 1. 1877 1d rose on cream postal stationery postcard in unused condition overprinted 'O.S.' for OFFICIAL use. 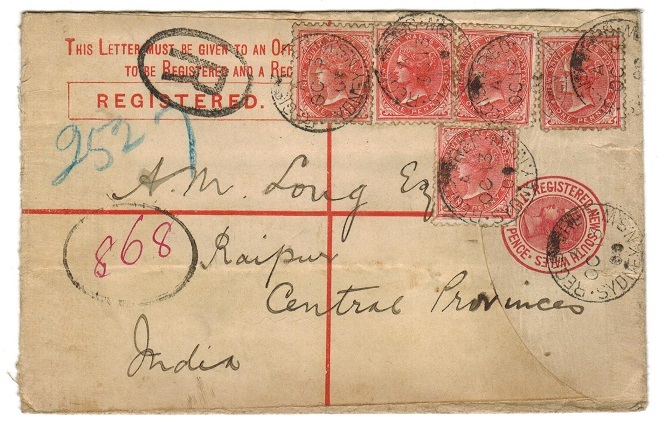 The reverse is pre-printed for 'General Post Office' H&G 1. AUSTRALIA (New South Wales) - 1883 2d blue PSE unused overprinted 'O.S.'. H&G 2. 1883 2d blue on white postal stationery envelope in unused condition overprinted 'O.S.' for OFFICIAL use. H&G 2. 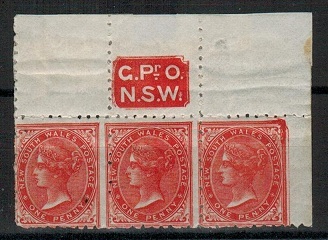 AUSTRALIA (New South Wales) - 1882 1d brick red PSE unused pre-printed 'O.S.'. H&G 7. 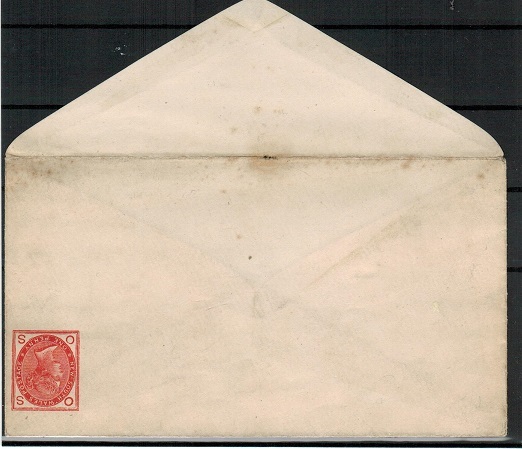 1882 1d brick red on white postal stationery envelope in unused condition pre-printed 'O.S.' in the four corners. H&G 7. AUSTRALIA (New South Wales) - 1888 1d brick red PSE unused overprinted 'O.S.' H&G 3. 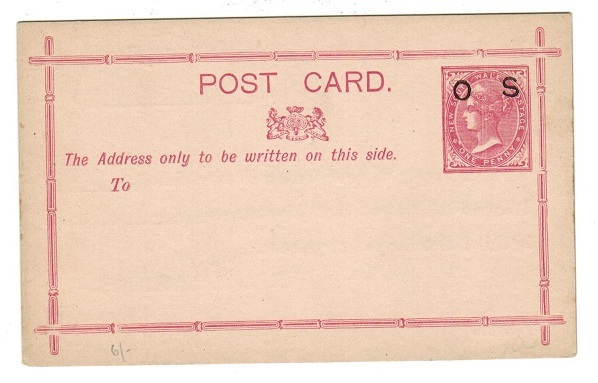 1888 1d brick red on white postal stationery envelope (flap partly stuck down) in unused condition overprinted 'O.S.' for OFFICIAL use. H&G 3. AUSTRALIA (New South Wales) - 1899 2d cobalt blue IMPERFORATE pair. SG 302a. 1899 2d cobalt blue adhesive in a fine horizontal IMPERFORATED pair printed on gummed paper. SG302a. AUSTRALIA (New South Wales) - 1867 4d IMPERFORATE PLATE PROOF. 1867 4d imperforate PLATE PROOF printed in issued colours of red-brown. (SG type 32). AUSTRALIA (New South Wales) - 1886 1d scarlet IMPERF MARGIN and RETOUCH varieties mint. SG 243. 1886-87 1d Scarlet (perf 10) in a fine mint corner strip of three with 'G.Pr.O./N.S.W.' imprint in top margin. Row 1/6 with RETOUCHED CORNER FRAME & IMPERFORATE TO RIGHT MARGIN. A nice attractive piece. SG 238. AUSTRALIA (New South Wales) - 1886 1d mint IMPERF RIGHT MARGINAL pair. SG 243a. 1886-87 1d scarlet (perf 11x12) in a fine mint vertical pair. 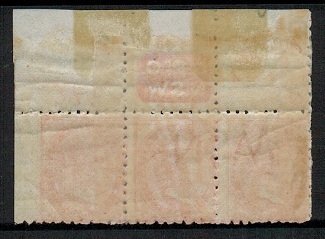 One example wih major variety to top left corner & with both stamps IMPERFORATE TO RIGHT MARGIN. SG238a. 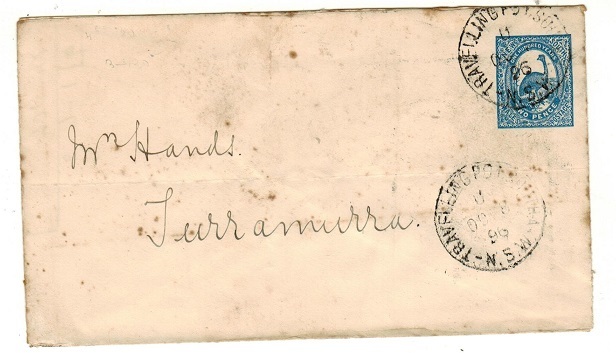 AUSTRALIA (New South Wales) - 1868 local cover with 6d used at SYDNEY. 1868 (FE.26.) 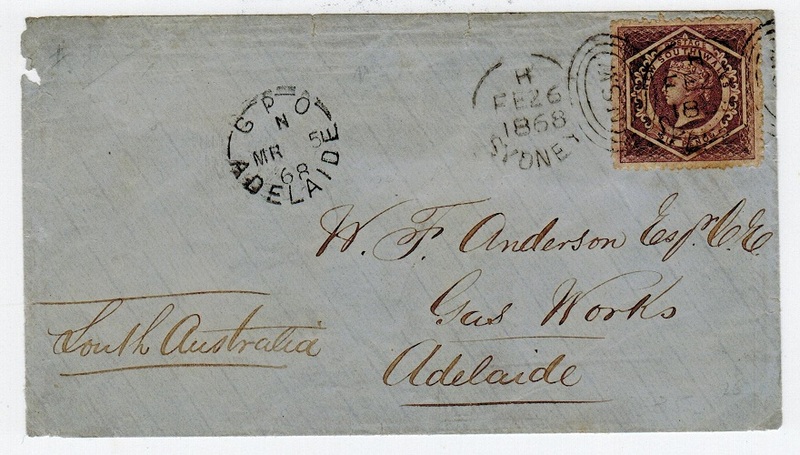 cover addressed to Adelaide bearing 6d adhesive (SG type 12) tied by oval NSW cancel with SYDNEY/H strike alongside and GPO ADELAIDE arrival at left.